Spanish 21 is another popular variant of twenty-one which is found in many land-based casinos. Here’s how to play. 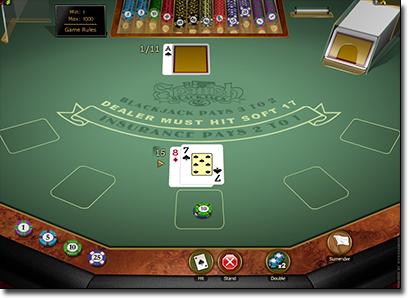 Spanish twenty-one may be the oldest form of blackjack in the world. The first reference to the game came over 400 years ago in a set of short stories by Miguel de Cervantes, who was himself an avid gambler. One of those stories mentioned a game called ventiuno (or twenty-one) which had the 10-removed. As you might have guessed, the players in the story cheated at cards. Lucky for 21st century gamblers, the games are a little more honest these days. Even better, Spanish 21 played with the proper rules offers a better house edge than classic blackjack, sometimes as low as 0.20%. You won’t find a better game from a gambler’s perspective. The distinctive feature of this game is the 48-card “Spanish deck”, in which all the 10’s are taken out of the deck. Other 10-ranked cards like jacks, queens, and kings remain in the deck, but this means natural blackjacks (and busts due to 10-cards) are less likely to happen. When you combine this game dynamic with rules that give big payouts for three-card 21’s, you have a completely different style of play than you’re used to. Besides the tens taken out of the deck entirely, most games use either the four decks or six decks in the shoe. In a land-based casino, the card are dealt out the shoe and up to seven players sit at the table. In the online game, the deck is reshuffled after each hand, so card counting has no value on the Internet. One of the distinctive rules which is much to the advantage of gamblers is the “super bonus” rule. This provides a large bonus if you hit a specific kind of twenty-one. When you receive a twenty-one made up of suited 777 and the dealer also holds a 7, you win the largest super bonus. Those who wagered under $25 receive a $1,000 bonus. Those who wagered $25 or more receive a $5,000 bonus. This provides the blackjack player a jackpot on the scale of the 3-reel classics in slots. Since the low payouts and the need to “grind” is one complaint gamblers who don’t like twenty-one have, this game splits the difference by giving a jackpot payment and a solid payback percentage. The 777 payout isn’t the only special payout, though. When you receive an all-spades 777 or all-spades 678 combination, you win a 3:1 bonus payout. If you receive a suited 678 or a suited 777 (but without the dealer 7), you’ll win a 2:1 payout. When players receive an unsuited 777 or unsuited 678, they win a 3:2 payout, as if they hit a natural 21. While you’ll see fewer natural 21’s like you would want in the traditional game, the lack of 10-cards in the deck means these three-card 21’s are more likely to hit. Players also don’t have to worry about pushes in this game. Instead, if you and the dealer would normally push on a twenty-one, you win the hand. Once again, this is a major advantage for gamblers. As you might expect, certain drawbacks are written into the rules to assure the casino still holds a house edge. Those who are familiar with card counting get the implication of having fewer 10’s in the deck. The more tens are in the deck, the better the chances are you hit a natural 21. If you hold an 11 or less after the deal, you also have a better chance of hitting a strong hand. That’s why card counters keep a running tally of the high cards, especially aces and those which count for ten. If you’re playing 6-deck Spanish 21, then the game starts as if the first 24 cards out of the classic blackjack deck were tens. That’s a huge disadvantage for the player. Another stipulation offers excitement for gamblers, but at another disadvantage. The “Match the Dealer” bonus pays off a side bet, if your cards match the dealer’s upcard. A suited match in a six-deck game pays 9:1, while an unsuited match pays at 4:1 in the six-deck variation. This version of the side bet has a house edge of 3.06%. The eight-deck game offers 12:1 on suited matches and 3:1 on unsuited matches, for a much different dynamic. The side bet on 8-deck games has a house edge of 2.99%. Any game this good gets talked about a lot, so you’ll hear about oddball rule variations which increase the house edge or give players a positive expectations. We treat the former as if it’s possible and the latter with a great deal of scepticism – we’ve even read about one casino in Malaysia didn’t allow doubling on anything but the first two cards. There are all kinds of stories out there, like the one about a casino which paid 3:2 on an A-10 after splitting aces. This would be a rare treat, but don’t expect to find that version of the game anywhere you play. The Native American casino in Connecticut, the Mohegan Sun, is known to disallow drawing to split aces, which negatively affects the house edge by nearly 0.30%. The point being, while the rules discussed in this article are the ones you’re most likely to find land-based casinos, you might find something else in a gaming venue near you. Always make sure you’re fully aware of the stipulations under which you play. Players wanting to try out this old, yet exciting, form of 21 can play at any Microgaming casino. Microgaming is a private company based on the Isle of Man. Most casinos which use Microgaming software offer over 600 games. We recommend playing Spanish 21 at secure sites like All Slots Casino, G’day Casino and Royal Vegas Casino.